There was no post this week on Wednesday because I was ill. Which although meant I spent the week getting over some kind of cold bug, it also reminded me of the importance of being able to talk to people in Japan about when you’re sick, and what Japan expects from sick people. So this post is about the culture of being sick in Japan and some useful phrases to use if you find yourself sick in Japan. Believe it or not Japanese people expect sick people to act in a way that might be different to what you’re used to. There are no doctor surgeries in Japan, only hospitals. So whether you have a cold or a broken foot it’s off to the hospital you go. Oh, and you can only go during opening hours during the week. If you’re sick after 5pm or at the weekend you pretty much have to wait unless you want to fork over a lot of money to cover calling out the ambulance and doctor when he’s at home. If you have a cold or hay-fever wear a mask! Blowing your nose is public is gross and rude! So if you do feel well enough to venture out you should wear a face mask to protect others from your illness and to stop you from embarrassing yourself. If I need to blow my nose I will often go to the bathroom and do it in private. This is why lots of Japanese people wear them during the winter and summer when colds and hayfever are most common. This is a bit of an exaggeration but I’ve found that when you’re sick the doctor’s often prescribe you with cold medicine. A friend of mine went 3 times over the course of a month and although kept telling them it was a chest infection they insisted it was a cold. She did eventually get antibiotics but only after she forked over 10,000JPY ($100) per visit to see the doctor and pay for the cold medicine she didn’t need. 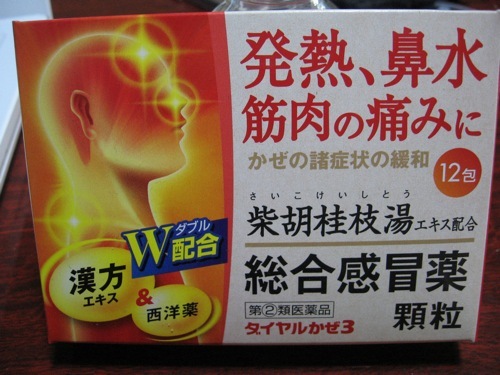 There are also different kinds of colds, かぜ (kaze) a “normal” cold with coughing and sneezing, and インフルエンザ (infuruenza) which is more extreme swelling of glands, aching bones, fever etc. You should go to hospital if you ever get either of these. Or at least Japanese people will suggest you do. Or you could just stock up on cold medicine in advance and stay at home. Departments stores in Japan have EVERYTHING. Often including a pharmacy section which sells all kinds of stuff you wouldn’t normally get in your country in text you probably won’t understand. These include shampoo, soaps, diet pills (for both men and women) and make up (for both men and women). But if you’re sick (or want to prepare for an incident if you are sick) you can ask the shop attendants for some advice. You can also find these kinds of drug stores outside of department stores as they will often have a big 薬 (kusuri = medicine) sign somewhere. For someone like me from the UK medicine in Japan can seem really expensive, and the fact that you have to pay about £50 just to see a doctor is ridiculous. But if you’re living in Japan for a long time it’s work getting their equivalent of national insurance to help make these costs a bit less painful. You can’t do much about buying off the shelf medicine from the pharmacy though, which can still be up to 3000-6000JPY ($30-$60) a pop. As I said you go to the hospital if you’re sick, but unlike Westerners toughing it out, the Japanese will often go to hospital if they have a cold. If it’s really bad (and they have the money) they’ll even spend a few days sleeping at the hospital to recover. If you get a cold and mention it to a Japanese friend they will often insist you go to the hospital and will not take “no” for an answer. Tagged Being sick in Japan, Ill in Japan, Visiting Japan.